The Atlanta Braves were one of the most successful franchises ever during the 1990’s, and many prized baseball collectibles for the team can be found during this era when many future Hall of Famers played. To put it into perspective how great the Braves were during the decade, the team averaged 93 wins per season, and won the division title in eight out of the ten years, along with five National League pennants and one World Series title in 1995. 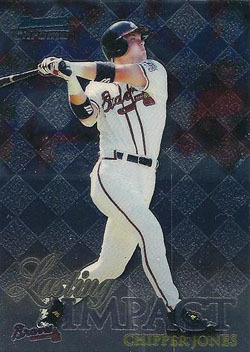 What follows are the top five Atlanta Braves players from the 1990’s. Greg Maddux was a part of the “Big Three” starting pitchers that were the foundation of Atlanta’s success during the decade, and will more than likely go down as one of the greatest pitchers to ever play the game. From 1993-99 when he was with the Braves, Maddux earned an amazing 7 Gold Glove Awards, three Cy Young awards, and went to five All-Star games as well. He compiled a record of 136-51 (.712 winning percentage) with an ERA of only 2.34 to go with over 1,200 strikeouts and 15 shutouts as well. 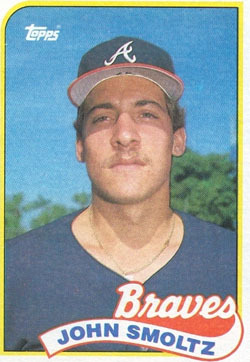 His best season came in 1995 for the Braves, when Greg went 19-2 with a 1.63 ERA and 10 complete games with over 200 innings pitched and a WHIP of only 0.896. 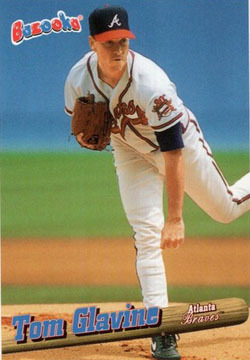 Tom Glavine played more of a role with the Braves during the 1990’s than Maddux as he was brought up through the team’s farm system, but didn’t put up quite as good of numbers as Greg did during his time with the team, hence him being in the number two position. From 1990-99 Glavine went 164-87 (.653 winning percentage) with a 3.21 ERA, 38 complete games, and nearly 1,500 strikeouts as well. 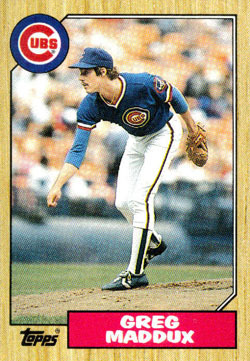 Tom went on to make six All-Star teams and won two Cy Young Awards, and should easily make it into the Hall of Fame in 2014 on the first ballot with Maddux. Like Glavine Smoltz spent the entire 1990’s with the Atlanta Braves having come up in their farm system, and put up equally good numbers as well. Smoltz went 143-95 from 1990-99 (.601 winning percentage), with a 3.32 ERA, 42 complete games, and nearly 1,900 strikeouts as well. His lone Cy Young Award came in 1996 when John went 24-8 with a 2.94 ERA, comprised of over 250 innings pitched and an amazing 276 strikeouts (or 9.8 strikeouts per 9 innings). With over 200 wins and 150 saves for his career, Smoltz will likely join the former two in the Hall of Fame as well, making their memorabilia that much more important to get right now before it skyrockets. Last but certainly not least there is Chipper Jones, who came up with the team in the 1993 season and soon made a name for himself at third base. Through the decade Jones averaged .301 with 26 home runs, 87 RBIs, and nearly 150 hits, playing an important role for the team during their run to the 1995 World Series title. His best year came in 1999 when Chipper hit .319 with 45 home runs, 110 RBIs, and 25 stolen bases, winning the MVP and Silver Slugger awards. Having just retired in 2012, Jones’ memorabilia should also increase in the coming years as he will also look to join the Hall of Fame with the Big Three.